Sooo...as you may or may not know there is a new local cycling event happening in Aberfoyle soon! In just under a months time 'The Dukes Weekender' will be happening in our village. With things finally coming together for the event we wanted to give you all some background, information and the weekend schedule. We'd have loved to do this a little sooner but unfortunately it's taken a while to confirm all the details with relevant parties so here we are :). The two of us making the event happen are Stu Thomson and Rob Friel, we're both keen local cyclists with young families living in Gartmore and Aberfoyle who decided on a ride at the end of 2017 that we should try and bring an event to Aberfoyle. There were 2 main reasons for wanting to take this challenge on; firstly as local cyclists we love the cycling on our doorstep, it is truly amazing, we love showing it off and particularly the offroad riding is less well know with riders heading to the Borders or up North to get their bike fix. Secondly it was no coincidence that we started pulling things together after Guyana closed down. We felt that with our enthusiasm and contacts in cycling we could do something to try and bring new people to the area to enjoy it, spend money and hopefully come back in the future. Despite both having full time jobs, 3 children under 3 between us we decided to do something about it! So the Dukes Weekender was born... A 2 day cycling event that hopefully will bring people to the village to discover the area, spend time and money locally and enjoy some amazing cycling. The event will run over the weekend of the 8th/9th September. We made this deliberately outside summer season and a 2 day event so (on the basis we can attract participants) it has a positive impact on the local economy. Afternoon Kids BMX/Pumptrack and Demo Bikes: Phil at the Forth Inn has kindly allowed us the use of his carpark to setup the kids bmx/pumptrack. This has been provided courtesy of Stirling Council. In addition 2 kids bike brands (Ridgeback and Saracen) will be on hand to offer demos of their bikes for children. This will all be free of charge and run all weekend from Saturday lunchtime so bring the kids down to try it out! 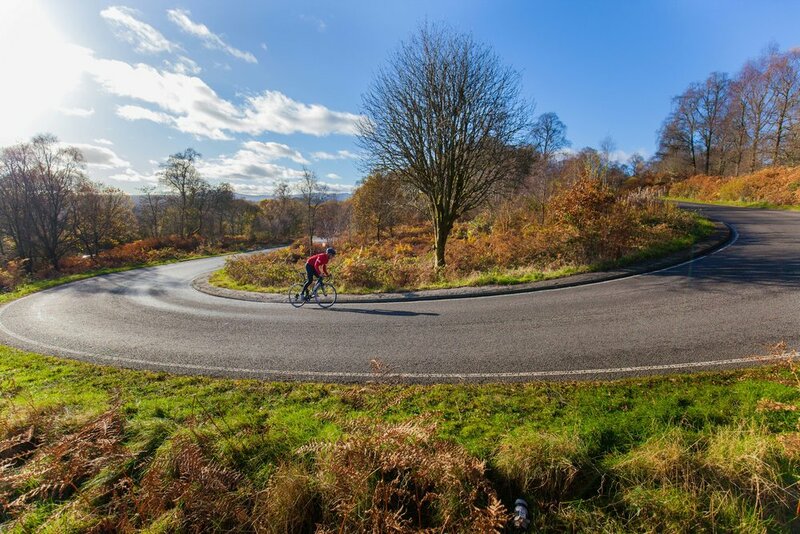 Hillclimb 4pm - 6pm - Dukes Pass: The Dukes Pass is such an iconic road for cyclists so we decided that the opportunity to close the road, line it with people and get a festival vibe going could be an amazing thing! This is where we need you the locals to come out in force, support the riders and help make a spectacle of this. So far the support has been amazing! For example lining the route we'll have Ab Trad playing (thanks Cindy! ), a cake stand (thanks Madeliene! ), a drummer and a Bar at the top! If you're around and can give the riders a cheer then please come out and make some noise! Road closure 3pm - 7pm: With the hillclimb event comes some restrictions on the road from the corner of the Main Street to Enda and Cindy's house (the cottage near the top). We really want to minimise disruption for local residents so have kept it to later on Saturday for a minimum time. We plan to use just the left hand side of the road (driving out of Aberfoyle) for riders and local access will be in place on the right until the edge of the village. From the edge of the village there will be a full closure will be in place to make this a truly special experience. Go Ape and Forestry are the only business affected, have been informed and are very supportive (GoApe are kindly supplying prizes for some weekend events). The closure is confirmed through Stirling Council and being operated by Central Traffic Management rather than ourselves. They will be handling specifics and will be responsible for informing local residents who are affected. We really wanted to have information out to them sooner so to ensure everything is as smooth as possible though so please send us an email at info@dukesweekender.com if you have any concerns at all. 7pm - 10pm Dukes Gathering at The Forth Inn: For this special evening we've brought some cycling royalty together for an amazing night of chat and films in the back of The Forth Inn. This is in aid of a good cause. Even if you have only a slight interest in cycling this evening will be full of amazing stories! The speakers we have are Graeme Obree (think the washing machine bike guy), Lee Craigie (All-round MTB girl adventurer and Radio Scotland host), Geoff Waugh (Legendary Photographer) and Andy Mckenna (The Dude with a big beard and great life stories). Google a few of them if you haven't heard of them, it will be a special night! There are details and a few tickets still available at - https://www.eventbrite.com/e/the-dukes-gathering-presented-by-endura-tickets-48271466255. Big thank you to Phil Crowder for the support! All Day- Kids BMX/Pumptrack and Demo Bikes: Again the BMX track and kids demo bikes will be available all day at The Forth Inn so come back and let the kids try it out again! 9.30am - 11am Children's Enduro: Open to riders aged 8-14 we're giving kids a taste of 'Enduro'. A 10km loop heading out towards Cobleland, Gartmore and back to Aberfoyle. This will have 2 timed 'stages' where the kids will race as fast as they can. Details and entries on our website if you'd like to get your kids tired out on a Sunday! 10.30 - 5pm Gravel Enduro Event: This is a 60km, primarily offroad event, running in a figure of 8 loop through the village. The format is 'Enduro' which means that around the 60km loop there will be 5 timed stages around the loop where riders will race. Each of these are between 3-10 minutes in length. The first 30km will take riders over to Loch Venacher and back, stopping in the village for lunch before completing the remaining 30km out towards Gartmore, Loch Ard and then back. Access wise there will be very little impact on locals. Due to safety reasons we'll be closing 2 short sections of trails for the event. These will be the cycle path running along the south of Loch Venacher from the 3 Lochs Forest Drive to Invertrossachs and the short footpath trail loop on the south side of Loch Venacher. Forestry Commission/National Park should be releasing details of these soon however all other trails and forest roads remain open. The closest stage to the village will be out at Loch Ard near the Milton Carpark so if you're out and about then go and give the riders a cheer! Overall it is difficult to tell exact numbers for the weekend just now (entries are open for another 2 weeks) but we're estimating around 100 riders for the Hillclimb (which will make it the biggest in Scotland), 150-170 for the Gravel Enduro and 30-40 kids racing... This means approx 100 people plus their husbands/wives/familes will be staying locally and using local businesses which we hope is a great thing for everyone. That about covers it we hope... thank you to all the locals who have been so supportive in helping us make this event a reality. We truly hope it is positive for the community and once it's all done and dusted we'll have a beer, gather some thoughts from everyone and see where we are!